To make the teriyaki sauce, place the ginger, mirin, soy sauce, sugar and water in a medium bowl, stir to combine and set aside. To make the tofu balls, place the chickpeas in a food processor and process until smooth. Place in a large bowl, add the tofu, soy sauce, flour, ginger, garlic, onion and spinach and stir well to combine. Roll tablespoons of the mixture into balls. Heat the oil in a large heavy-based frying pan over medium heat and cook the tofu balls, turning, for 4 minutes or until lightly golden. Reduce the temperature to low, add the teriyaki sauce and cook, turning, for 4 minutes or until the sauce has thickened slightly. Divide the tofu balls and nori between bowls. Top with the coriander and sesame seeds and serve with the rice. Serves 4. I made this tonight. I added steamed book toy, beans and carrots. 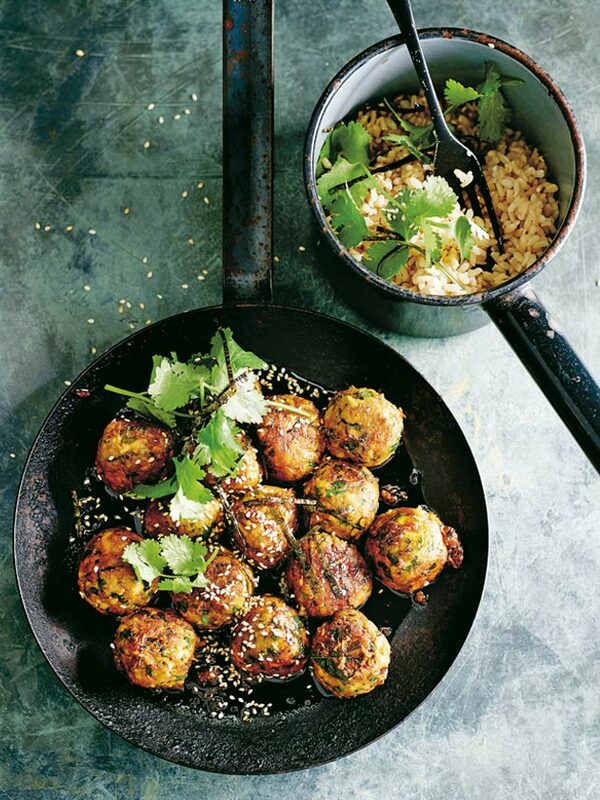 The tofu balls had great flavour but unfortunately were not very firm and kept crumbling throughout the cooking process. I would suggest refrigerating the balls for at least 30 mins prior to cooking. The sauce was delicious, however it did not just thicken, it disappeared (absorbed by the balls maybe?). I would suggest making extra of the sauce, adding the original amount to the pan with the tofu balls, and warming the extra amount in a separate pan to drizzle over the dish.